I spent some time in the office Saturday morning trying to catch up while I was waiting to pick up my daughter from swim practice. As I was going through my email I came across one entitled, “Activate your myHealth Matters account now!” https://myhealthmatters.limeade.com/User/Signup.aspx I knew it was coming and promised our director of employee health, Dr. Phil Adamo, that I would activate my account. myHealth Matters is currently available to employees at the Medical Center, but will be rolling out to our other employees and hospitals soon. Phil promised me that the information provided was absolutely confidential for everyone who registered. I didn’t have my employee ID number handy to sign onto the site, but this was easily retrieved by going to HRConnect https://myhrconnect.org/SHCM/index1.jsp . The health survey took about 20 minutes and the feedback was incredibly helpful. Although it told me many things I know — I need to exercise more, lose a few pounds and reduce the stress in my life (yeah, right) — it also gave me some great advice about how to increase my energy level, such as eating less sugar, drinking more water and exercising so I’ll sleep better. Being the best place to give care starts with helping all our employees stay healthy and myHealth Matters is a great way to get started. I hope you will all join me in activating your accounts so we can get in shape together, because your health really does matter to us. Gemba is a Japanese term that literally means “management by walking around.” If you’ve read this blog in the past, you know that I take this approach to heart. I make an effort to “round” on the units and in the clinics to see, firsthand, how things are going. I’ve also made it mandatory for my leadership team to do the same. I had a chance to visit Marlborough Hospital a few weeks ago, where I spoke with the front-line staff, visited with patients and then provided the management team with feedback. The patients were very happy with the care they received and the only complaint I heard was from one patient who waited several hours in the Emergency Department before he got a bed. Overall, he was very complimentary of everyone who cared for him during his stay. The staff had some legitimate concerns they wanted me to relay to management and I was happy to do so. I plan to visit again soon with the new CEO of Marlborough Hospital Steven Roach. Steven is a terrific person with a wealth of experience in health care management and we are thrilled he is joining the team. I also visited with the staff of 8 East on the University Campus at the Medical Center. As you may have heard, a tragic event occurred on the floor last week. The caregivers on 8 East are a special group of people that provides extraordinary care under very challenging circumstances, every day. To all of our caregivers on 8 East, please know that all 13,000 of us are 100 percent behind you during this difficult time. I continue to be impressed with the ideas that keep rolling in from all of your idea boards. 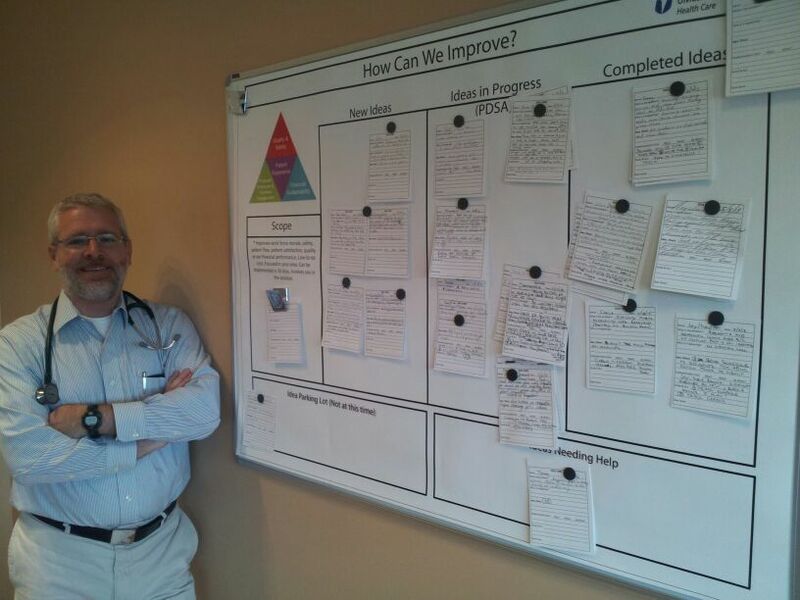 The caregivers at our Community Medical Group Pediatric and Internal Medicine practice in Westborough have been using an idea board since the spring. 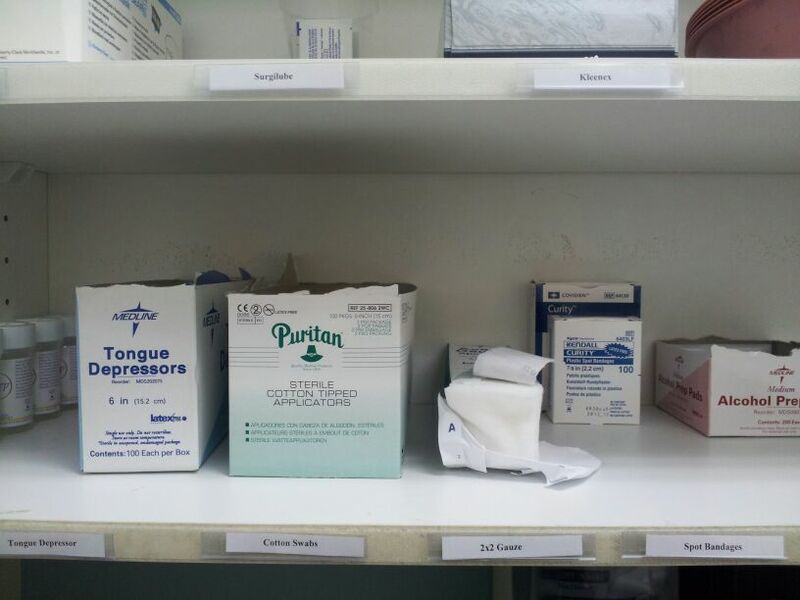 With four attending physicians and 16 residents using their 14 exam rooms, it was hard to keep track of supplies and inventory in each room. “It seemed like whenever I needed an item, I would look around for it in the cabinet for several minutes, and not finding it, would need to leave the room, and go upstairs to our larger supply closets,” said David Carlson, MD. This obviously brought dissatisfaction to the physicians, the staff, and of course, the patients who had to wait for staff to retrieve the needed supplies. After an idea huddle, Dr. Carlson, medical director John McCahan, MD, resident Jay Lawrence, MD, and medical assistant Sam Furber, chose one exam room as a pilot, and completely re-organized the supply cabinets and drawers. They reassessed the need for certain supplies, and implemented a removable label system to alert staff when a particular supply is running low. The fix has brought crucial minutes back to each patient visit, easing frustration levels for staff and patients alike. Great work team! Thanks for all your notes and everything you do to take great care of our patients and one another. This entry was posted in Employee Wellness, Employees, Idea System and tagged employees by Eric Dickson, MD, MHCM. Bookmark the permalink.